Loaded with real facts and blended with a fictional story, Death By Manicure by Dr Robert Spalding is an intensely entertaining book that not only educates the reader on the importance of salon safety but also keeps them captivated till the very last drop. Death By Manicure: A savvy nail technician uncovers a plot to kill women with poisoned ricin nail polish and offers readers a glimpse behind the curtain of the real world of nail salons and the beauty industry. 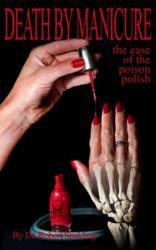 "Death By Manicure: the case of the poison polish" is an adult crime novel being released by Spalding Publishing as an E-book. Based on real facts the book highlights many problems hidden in America’s nail salons and delves into the recent, deadly domestic terrorist attacks with ricin as a diabolical weapon against innocent citizens. The book is centered around a brilliant nail salon technician who helps law enforcement solve a series of murders on unsuspecting nail salons patrons. The heroine is based on a real life nail technician, Athena Elliott, who is a leader in the US nail salon industry. The story unfolds as a disgruntled beauty chemist attempts to disgrace his old employer/manufacturer of beauty products. This mad scientist goes on a killing spree uniquely using deadly ricin-tainted nail polish under the misplaced perception that this diversion will help him to elevate his own brand. Death by Manicure is rich in controversy exposing the criminal mind of a domestic terrorist who allows ego, greed and the desire for fame to overwrite the ethics of business and justice. Dr Spalding, a podiatrist from Signal Mountain, Tennessee who has been recognized as the number one expert in the US on nail salon infections was recently featured on Anderson Cooper Live in February of this year with his documentary book, Death By Pedicure. Spalding will be launching two other e-books later this year and in 2014 called An American Playground and The Return of the Anami. Death By Manicure is available on Amazon and Barnes and Noble for download to Kindle or Book Nook. You can also purchase a PDF or the book directly from http://www.SpaldingPublishing.com.